VIZ Media Revives Yun Kouga's "Loveless"
Ritsuka Aoyagi, a troubled sixth-grade student, does not fit in at school. Even his fragmented memory alienates him from his own past. He is also grieving the loss of his older brother, Seimei, whom he believed had been murdered. Ritsuka meets Soubi Agatsuma, a handsome college student who claims to have been a friend of Seimei’s. Soubi introduces Ritsuka to a dark and vibrant world where there are spell battles and secret names and a secret society, Septimal Moon. Loveless, Vol. 13 finds Soubi and Seimei in top battle form, but has Seimei coerced Soubi back into the world of battle? Meanwhile, Miss Nagisa Sagan recounts the past of the Seven Voices Academy. It is the story of her sister, Sanae, and it is the story of a love triangle, of sorts. Sanae's partner, Ritsu Minami has fallen in love with a student-teacher, Choko Suguo, who is also a student at a local college. When Sanae steals something belonging to Choko, she earns Ritsu's ire, with tragic consequences. THE LOWDOWN: I had not read a volume of the Loveless manga in five years, not since I read Vol. 11 back in the summer of 2013! My VIZ Media rep recently sent me Vol. 13, so I am assuming that only one volume (Vol. 12) was published in the interim. 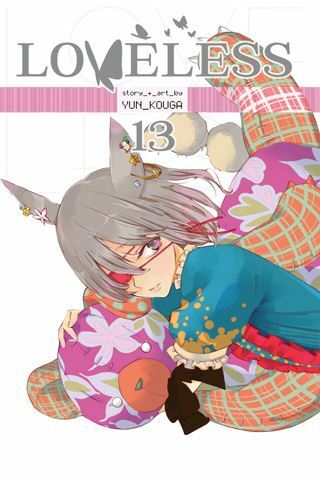 Once I was able to connect the character relationships and recall the series' main narrative and subplots, I found Loveless Graphic Novel Volume 13 to be an enjoyable read. For all its fantasy trappings, I find the series works best as a relationship drama that focuses on the connections of an ensemble cast. Yun Kouga can design some interesting fantasy battles, and there is one in Vol. 13. Still, the characters and their relationships are the stars here, so I think Loveless best serves those who have already become engaged with these characters. I READS YOU RECOMMENDS: Fans of Yun Kouga will want to try Loveless.